a hereditary inborn error of metabolism, appearing in various forms. The early onset or infantile form may appear as early as 6 months of age and is marked by osteomalacia, aminoaciduria, phosphaturia, and deposition of cystine throughout the tissues of the body, including the liver, bone marrow, kidney, spleen, and cornea, ending with chronic renal failure. It is the most common cause of fanconi syndrome (def. 2). The prognosis for children with the disease has improved greatly in recent decades. cysteamine (Cystagon) is administered to lower cystine levels within cells and may delay or prevent renal failure The benign or adult form of cystinosis does not affect the kidneys or shorten life span; deposition of cystine crystals occurs in the bone marrow, leukocytes, and corneas. 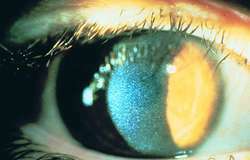 The condition is usually diagnosed by ophthalmic examination. The late onset juvenile or adolescent type falls in between the other two, with ocular and renal manifestations but often no resultant renal failure. A lysosomal storage disorder with various forms, all with autosomal recessive inheritance. The nephropathic form of early childhood is characterized by widespread deposits of cystine crystals throughout the body, including the bone marrow, cornea, and other tissues, with mild elevation of plasma cystine and cystinuria; associated with a marked generalized aminoaciduria, glycosuria, polyuria, chronic acidosis, hypophosphatemia with vitamin D-resistant rickets, and often with hypokalemia; other extrarenal manifestations include photophobia and hypothyroidism; due to a defect in the transport of cystine across lysosomal membranes caused by mutation in the CTNS gene on 17 p. The re is a milder form with onset in adolescence [MIM*219900] and one with onset in adulthood without kidney damage [MIM*219750]; the latter two forms are thought to be allelic to the nephropathic form of early childhood. /cys·ti·no·sis/ (-o´sis) a hereditary disorder of cystine metabolism; the most common type appears in childhood with osteomalacia, aminoaciduria, phosphaturia, and deposition of cystine in tissues throughout the body, leading to renal failure. a congenital disease characterized by glucosuria; proteinuria; cystine deposits in the liver, spleen, bone marrow, and cornea; rickets; excessive amounts of phosphates in the urine; and retardation of growth. Also called cystine storage disease, Fanconi's syndrome. See also cystine. Molecular medicine Any of 3–types I, II, III–AR conditios characterized by impaired transport of cystine across lysosomal membranes; the accumulation of cystine in lysosomes results in crystal formation in various tissues, in particular the kidneys; early renal tubular involvement results in Fanconi syndrome with FTT, dehydration, renal tube acidosis in infancy; cystal-related loss of glomerular function leads to uremia and death by age 10 Clinical Growth retardation, photophobia, hypothyroidism, and in later survivors, visual impairment, corneal ulcerations, pancreatic insufficiency, distal myopathy, dysphagia, CNS involvement Management Cysteamine- β-mercaptoethylamine, or phosphocysteamine removes cystine crystals. 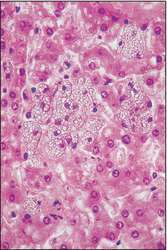 See Nephropathic cystinosis. A disease caused by failure of normal transport of cystine in lysosomes. In the infantile form, which may show itself as early as age two months, there is growth retardation, characteristic deposits in the corneas and fair hair and skin. The adult form involves the corneal changes and may affect vision to the extent that corneal grafting is necessary. Various other ocular defects may develop. George O.E., Dutch pediatrician, 1891-1954.